It is obvious there are many words we have not yet been spoken to each other, as South Africans, and many of our wounds have not yet healed. 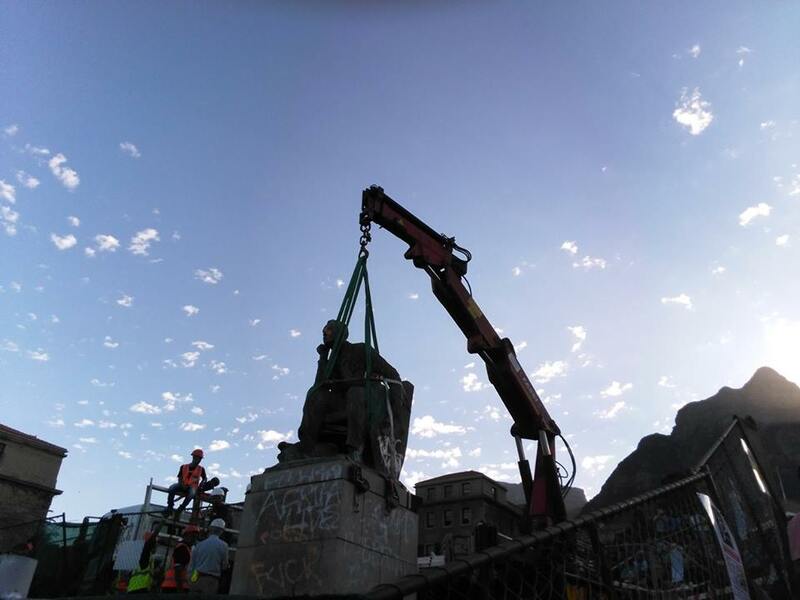 For almost a month, I’ve been reporting on the Rhodes Must Fall campaign at the University of Cape Town, which culminated in this week’s removal of the statue of British colonialist Cecil John Rhodes. For many of us, this campaign has given us a chance to speak and hear those many unspoken words and somehow try to address the wounds of our ugly past. It takes me back to an evening last September, on Church Square in central Cape Town, where a debate about our collective history was discussed. As a person of colour with an ancestry that includes a slave history, I questioned aloud how the city of my birth offers hardly any public memorialisation of that history. The District Six Museum does an annual slave walk, but that’s it. On the other hand, a ten-minute walk from the country’s Parliament building on Plein Street, past Church Square and through the city’s Company’s Garden shows me a handful of colonial and apartheid era statues of men who shaped the ugly history of our beautiful country. The history of my people, whose contribution is very much part of this history, is nowhere visible in this city. This is the same for the city’s black African population. And while the country has been exported globally as a Rainbow Nation and melting pot of diversity, locals have complained often that Cape Town remains a hotbed of racism. We still see the after effects of segregation in the way this city’s folk socialise. One could live for weeks on end in your own ghetto in this city without having any meaningful interaction with someone from another race group. The Rainbow Nation still eludes us. So when the Rhodes Must Fall campaign grew, and the statue came down this week, those many unspoken words made its way into our daily conversation and pure hate speech appeared all over the Internet. Evident on Thursday at the University of Cape Town were two striking conversation points: black pain and black anger. Rhodes Must Fall campaigner Busisiwe Nxumalo summed up the first sentiment. She had stood on the platform from where the Rhodes statue was removed that afternoon and held up a poster that read ‘Black pain is not negotiable’. She intrigued me. And during a conversation, she talked about what black pain means to her. “Black people were never given a chance to air their views,” she said. “We had colonisation then apartheid. Then we were told we have a Rainbow Nation, we need to forget everything, and move on. I looked at the world from her perspective. And imagined the insecurity that must come from being the subject of an institutional hierarchy coupled with racial hierarchy. It cannot be an easy world to navigate and feel at ease with. And it is true: we never had a chance to address our pain. Many would prefer to just forget and move on. This is possible in an ideal world, where we do not ask questions about our history and how its effects are still entrenched. During an online discussion on my Facebook profile, a friend commented, “We are impatient. We cannot wait anymore”. This was in reference to what seems to be the slow pace of transformation from apartheid era thinking to a consciousness of inclusivity and diversity. Some of my white friends felt their history was being erased as statues of white men from the colonial and apartheid era around the country are being vandalised. Well-known white South Africans have defended the statues and a worker’s union with white interests at heart has appealed to a court to stop the vandalisation of statues. Meanwhile statues continue to be vandalised as a means of registering the discomfort that black South Africans feel towards colonial and apartheid symbols. 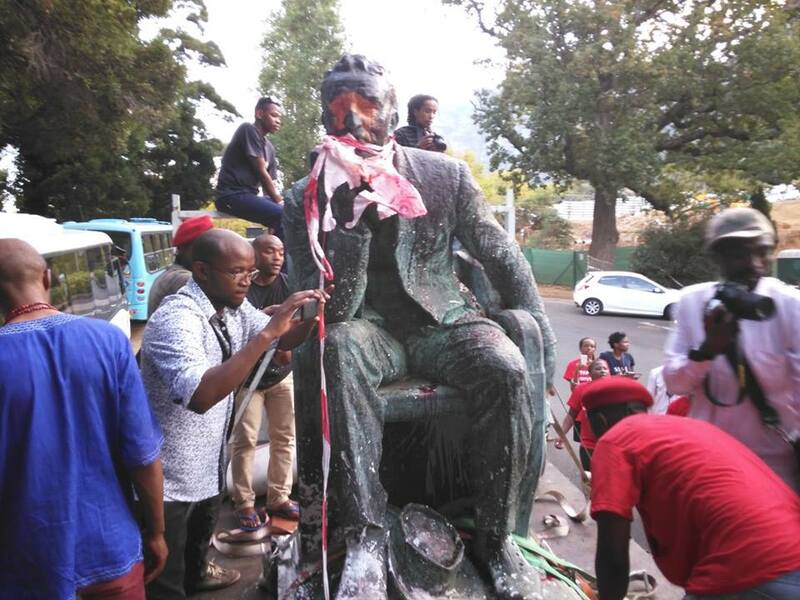 In Cape Town, the statue of Louis Botha outside Parliament was last week also vandalised as a form of protest against what some feel is a public and problematic reminder of our past. Black anger on the other hand, particularly evident on Thursday, has also indicated there is a need to address deep-seated hatred between black and white South Africans. While waiting for the statue to be removed, members of political parties chanted the slogan, “one settler, one bullet”. In a transitional society, where we are aiming to erase racism, this is problematic because it stirs tension based on race. It is violent language, and violence usually starts with words. I made my way on to the back of the truck that was transporting the Rhodes statue off UCT campus. By then, members of the Economic Freedom Front political party had splashed red paint over the statue. The anger on the back of that truck turned violent. Young people beat the statue with a belt and sticks, while swearing at it. They seemed to be taking revenge for all the savagery that Rhodes and his ilk had perpetuated during the colonial period. It is an anger that we need to understand though before we can move on. One could so easily appear to be condescending when talking about this. One could be accused of not understanding black anger. One could be accused of not being black enough to know the pain black Africans have endured. This is the exclusivity of pain that people talk about when wanting to dismiss any criticism. It is such a turn-off towards any meaningful reconciliation. 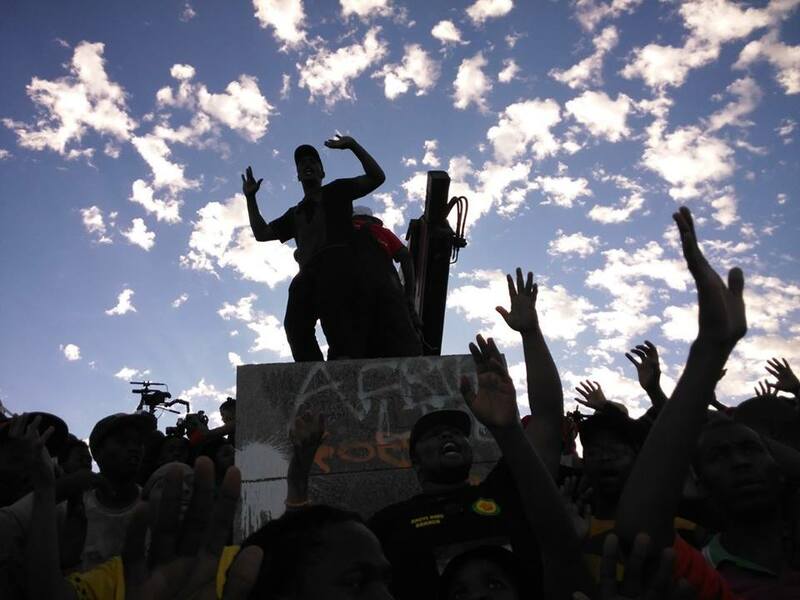 While still on the truck, EFF members tried to push the statue to the ground. Some of them jumped off the truck and stopped it. I was still on the truck and EFF members on it expressed uncontrollable anger. They had only one mission: to push the statue off the truck. UCT students stopped them, and later accused political parties of wanting to hijack their campaign victory. We made our way back to the spot where Rhodes had looked over the UCT rugby fields for decades. It will likely be the scene of many more protests and debates, as UCT marches forth on a path of transformation and inclusivity. I’ll be watching that space. Students who continue occupying Bremner Building and others who post racist comments on social media websites could face prosecution, said University of Cape Town vice chancellor Max Price yesterday. Price’s hard stand against students comes a day after their Rhodes Must Fall campaign reached its goal of having the statue of British colonialist Cecil John Rhodes removed from the campus. The statue is being temporarily removed though until a decision is made on its final destination. Student protesters and some university staffers occupied Bremner on March 20 after one of their protests on campus. They vowed to occupy the building until the Rhodes statue was removed. Price said protesters had breached the agreement they had with UCT leaders “informed students that failure to comply with the requirement that they end their occupation of the building will be unlawful”. “(It) will be a contravention of the rules of conduct and will have disciplinary consequences. We also informed the occupiers that should they not comply, we will have no choice but to approach the high court for an order compelling them to do so,” said Price. He said students have been “severely disrupting the work of UCT administration, including, from time-to-time, behavior that had the effect of harassing staff and evicting some from their offices, and disrupting meetings”. “We have moved staff to work in other buildings and some have worked from home. We have tolerated this disruption to allow the process of consultation and decision on the removal of the Rhodes statue to run its course,” he said. Price said the university would not tolerate violence, as witnessed during the Rhodes statue removal on Thursday. Some students and members of political parties present – EFF, ANC and PAC – had pushed down the fencing that surrounded the statue. EFF members had also stopped the truck removing the statue and wanted to push the statue off the back of the truck. He said Rhodes Must Fall campaigners have also “crossed a line of acceptable protest, ignoring the SRC’s pleas, when they stormed into the (UCT) council meeting on Wednesday”. “This behavior was completely unacceptable, challenged the authority of council, could have risked preventing council from completing its business, and will result in prosecutions of the students involved,” said Price. He added: “I am also aware of the incidents of chants of ‘One Settler, One Bullet’ as was heard at both the council (Wednesday) meeting and at the occasion of the removal of the statue. “I wish to express my dismay that this has happened, condemn all acts of intimidation and reckless utterances as they have no place in our democracy and are in serious conflict with the values of the university. Price said they have also been “disgusted by the volume and vitriol of racist comments made primarily in the online social media, but also some graffiti on the boards assembled for people to write comments on”. “We are investigating every one of them. Most are under pseudonyms and cannot be traced. Where there are names, we have not been able to link any such postings to any UCT students or staff. But if we can, we will be determined in prosecuting the authors,” he said. Rhodes Must Fall campaigner Busisiwe Nxumalo said they remained committed to occupying Bremner, which they renamed Azania House, “until all our demands are met”. “We are still going to occupy the building. We want to fight for workers and make sure that students are heard. This whole system is not designed to cater for us. We are going to occupy indefinitely until all these problems are solved. We will get there,” she said. Nxumalo said the removal from campus of the Rhodes statue was a “small victory”. “It’s the beginning of a long road to decolonisation at UCT. We are trying to fight against institutional racism. Today is a starting point,” she said. Student representative council president Ramabina Mahapa said the student body had distanced itself from the Bremner occupation. “We have called off the occupation but students are remaining. We said we could occupy until the statue has been removed. The statue has been removed. So we have done our part. But students want to remain in the building,” he said. Mahapa said shortly after the statue was removed that “so many things could have gone wrong”. “We managed to stop people who belonged to the EFF (Economic Freedom Fighters party). They wanted to do something we didn’t agree on. We find that problematic. We tried to maintain law and order and they tried to agitate,” he said. He said their mission remained transformation within UCT’s halls. “Just removing a statue does not mean UCT has transformed. We need to deal with transformation,” said Mahapa. Price said UCT had a “renewed focus on the transformation issues that clearly challenge us”. “We have committed to concluding the review of symbols and names by the end of this year. We have created a space for black academic staff… to develop a programme within each academic department that addresses the issues of staff transformation,” he said. Price said the Rhodes statue had been moved to a “safe place”. Hannetjie du Preez, acting chief executive Heritage Western Cape (HWC), said the statue “forms part of the declared provincial heritage site known as the Upper Campus” on UCT. By law, “no person may destroy, damage, deface, excavate, alter, remove from its original position, subdivide or change the planning status of any heritage site without a permit issued by the relevant heritage resources authority, in this case HWC”. She said: “In light of concerns for the safety of the statue, an urgent application was made to HWC for the removal and temporary safe-keeping of the Rhodes statue by the university. UCT said it would “now engage in a public participation process to help determine the final venue of the statue”. Muslim leaders across Cape Town have warned parents to monitor their children’s political views after a teenage girl was stopped from traveling to global terror group Islamic State (IS) this week. State security department officials stopped a 15-year-old girl from the quiet Kenwyn suburb from boarding a flight from Cape Town last Sunday. She was headed to Johannesburg, from where she was to fly either to Saudi Arabia or Turkey, and make her way to Syria where IS has a stronghold. The Cape Town-based Muslim Judicial Council met on Thursday with various leaders to discuss the matter. Imams at various mosques yesterday focused their sermons on IS, aiming to raise awareness of its recruitment of local teenagers. The teenager and her family have meanwhile left Kenwyn “to get some privacy,” said local community leader Hanif Loonat. MJC leader Maulana Ihsaan Hendricks said they “convened an urgent awareness meeting on the… (IS) recruitment methodology and its impact on South African society”. “The meeting focused on the potential dangers facing our children, youth and community following an incident where a 15-year-old teenager was suspected of being lured to join IS via social media,” he said. The MJC said it had “made attempts to contact the family of the young lady at the centre of this incident but our efforts have not yielded any results”. Weekend Argus attempts to contact the family this week, via contact numbers on a missing person’s flyer with the young girl’s face, were also unsuccessful. Hendricks said the MJC believed IS “does not represent Islam, a position that is held globally”. “We are concerned that more than condemnation is needed to protect our community from IS very aggressive and sophisticated recruiting methodology and their extensive use of the social media to lure our youth to join the terror group,” said Hendricks. Shaykh Ihsaan Taliep, president of United Ulama Council of SA (UUCSA) and also an MJC leader, said IS “principles have no connection to the tenets of Islam”. “It is vital for religious leaders to take responsibility for guiding the community with the correct information in order to safe guard them from the dangers lurking in the cyber world, which enters the very bedrooms of our children,” said Taliep. The MJC said parents should “be in touch with their children, know who they associate with, what their political views are and what their interests are”. It said it “extends its concerns and prayers for the wellbeing of the young lady at the centre of this very disturbing incident”. “We wish the family well and hope that they will be able to rise above the difficulties that they are facing,” it said. Loonat, former chairperson of the Western Cape community policing board and Kenwyn resident, said he had been in contact with the family. “The family is not in the area at the moment. They want to have privacy. They have switched their phones. They are cutting all links with everybody,” he said. Loonat said they were aware of “many (South African) kids being enticed” to join IS. “A lot of kids are being approached. There are kids from Johannesburg and Durban who have gone. It is now coming to Cape Town. Many parents are keeping quiet (about it),” said Loonat. Loonat said parents should monitor their children’s online activity. “There are signs of radical behavior online. Some would use words like ‘I am prepared to kill’. They need to be approached and we need to tell them don’t get carried away,” said Loonat. 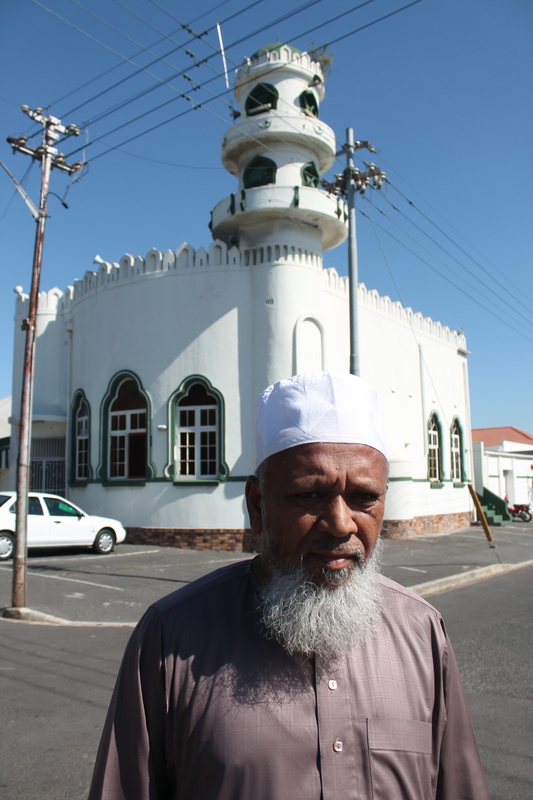 Imam Farouk Rylands, who leads the congregation at the Waterloo Road mosque in Kenwyn, said he held a meeting with locals at the mosque on Tuesday. “We told them this was a wake up call for our parents. Parents need to know more about their children. It was a shock to the community that a young girl made this decision,” said Rylands. Brian Dube, spokesman for the state security department, said after the teenager was stopped from boarding her flight in Cape Town “she was spoken to by the officials and handed over to the care of her family”. “This was the first case of its nature. However there have been reports of people who have left the country to take up part in wars as militias,” said Dube. “Recruitment and radicalisation of particularly young people is a global security concern. State security minister David Mahlobo said earlier this week they were alerted about the girl’s disappearance and then alerted all airports. “An investigation is underway to determine further issues pertaining to recruitment and funding methods,” said Mahlobo. ￼He said South African would “not allow itself to be used as a recruitment platform” for IS. ￼The South African embassy in Turkey to find out how many locals have been caught in that country for trying to join IS. The embassy’s response was that the ambassador was not in the country to respond to queries. Commuters and transport companies could spend thousands of Rands a month if tolls are implemented in the Western Cape, indicates proposed toll fees kept secret until now. Information about proposed toll fees government’s preferred bidder, Protea Parkways Consortium (PPC), plans to charge at tolls on the N1 and N2 highway, have made it into the public domain. Ten tolls would be implemented if the plan is approved. The City of Cape Town (CoCT) is meanwhile pushing ahead with its court battle to stop government and its South African National Roads Agency (Sanral) from imposing tolls on Western Cape routes. The two parties are to meet again at the Western Cape High Court on 11 August. On Tuesday last week, CoCT claimed a victory when the Supreme Court of Appeal in Bloemfontein ruled that Sanral should hand over various documents that it had withheld from public scrutiny. This included PPC’s bid document, which Sanral chief executive Nazir Alli said was kept out of public view, as it was “necessary to protect the competitiveness of the bids and the bidders’ confidential information”. “Sanral was not attempting to keep anything about the road secret. However, the bidding process had not been completed and it,” said Alli. PPC’s proposed toll fee structure can now be revealed via court order. If the tolls go ahead, it would charge different fees for four classes of vehicles. Monthly fees would run into thousands of Rands for commuters or companies that pass through tolls daily. Councillor Brett Herron, CoCT mayoral committee member for transport, claimed this week PPC “anticipates toll revenue in the region of R48 billion”. The city’s transport department appealed to the courts for the right to review Sanral’s bidding procedure. As a result, it obtained information that was previously unknown to citizens who would be most affected. Herron said: “As far as the city is concerned the project will not benefit road users because the toll revenue will exceed the road user benefits. Herron this week also accused Sanral of “misleading the public” about the proposed Winelands Tolling Project. “The public has not been given information on the proposed toll tariffs. They have only been provided with general information,” he said. He also raised concern about Sanral’s reimbursement provision that would see it compensate PPC for any income shortfall. “Should the national minister of transport determine lower toll tariffs than PPC is entitled to charge under the concession contract, Sanral must reimburse the concessionaire (PPC) by an amount that will place it in the same economic position it would have been,” said Herron. Alli said only the transport minister would set toll tariffs “once the competitive bidding process for the road is complete”. A Sanral statement this week confirmed the bidding process was “far from complete” although there have been indications PPC was its preferred bidder. Sanral said the CoCT has “regularly misconstrued and misunderstood both the numbers and the processes related to this road (the N1 and N2 toll projects)”. Alli defended Sanral’s decision to push ahead with plans to add toll stops on the Western Cape portions of these two national roads. “What is misunderstood is that roads, which are vital for infrastructural and economic development in our country, are expensive to build and maintain. A road is never finished,” he said. Alli added: “It brings with it enormous economic development. It is a strategic infrastructure project that is necessary to sustain and develop the Western Cape. He also said the “highways around Cape Town need urgent attention”. “Traffic congestion is now higher than anywhere else in the country, and the longer the delay in rectifying the situation, the worse it will become,” said Alli. CoCT argues there is no need for tolls on the Western Cape portions of the highways. Herron said Sanral did also not consider “whether or not low-income groups would be able to afford to use the N1 and N2 freeways should they become toll roads”. “The negative macro-economic impact on the region has not been considered, the effect it would have on the transport costs of agricultural products, to name but one,” he said. He said the CoCT would in court papers filed by April 25 “fully disclose the (PPC) calculations that are being investigated by nine experts… how much of every Rand collected in toll fees will be spent on the toll project infrastructure and operations as opposed to road improvements, maintenance and operational work”. N1 and N2 toll gate workers in Gauteng have meanwhile gone on strike for better wages. Chris Nkosi, Gauteng secretary of the South African Transport Workers Union (Satawu), said yesterday their strike started this week. It was in relation to PT Operations contracted to “operate certain highway toll gates on the N1 and N2” in Gauteng. Workers want their monthly salaries to increase from R2,000 to R4,500 a month. 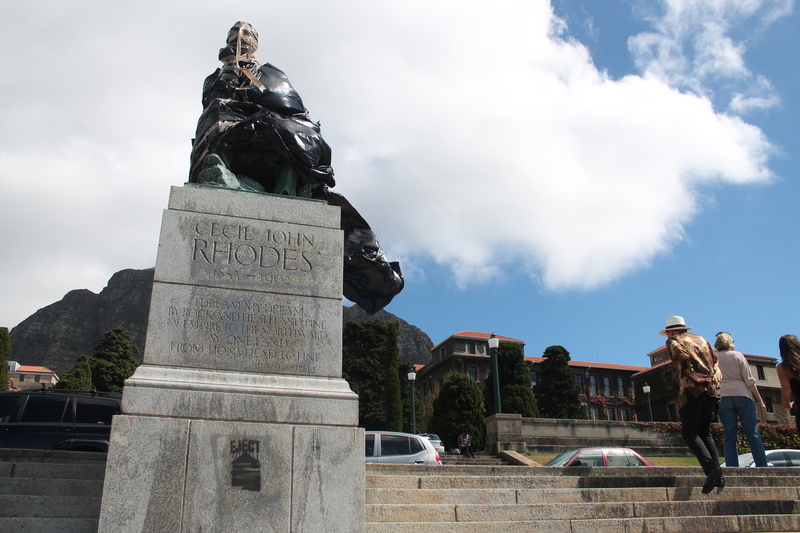 The fate of British colonialist Cecil John Rhodes’s statue will be decided this week when the University of Cape Town’s council votes on the matter. The 30-member council is set to meet on Wednesday to decide on whether or not the statue should be removed from campus. A group of students last month formed the Rhodes Must Fall campaign calling for the statue’s removal and for UCT’s leadership to address transformation within its halls. UCT senate last month recommended to move the statue. The council takes its recommendation from the senate, and usually votes along its views. UCT’s website informs the council “consists of the executive officers, other employees of the institution, students and persons not members of staff or students of the institution”. “Its responsibilities include determining the mission, objectives, goals, strategies and policies for the progress of the institution,” says UCT. Among council members are former Robben Island prisoner and retired Anglican bishop Njongonkulu Ndungane; retired judge Ian Farlam; UCT vice-chancellor Max Price; and UCT student council president Ramabina Mahapa. Councillor Garreth Bloor, the City of Cape Town’s mayoral committee member for tourism, events and economic development, is also on the council. A wider conversation about UCT’s transformation meanwhile continues beyond calls for the statue’s removal. Price and Ramabina are on a panel to discuss transformation at UCT’s Kramer Law Building this week Tuesday. The UCT Association of Black Alumni is organising the event. Other panelists include Iqbal Surve, past chairperson of the UCT Foundation and the Graduate School of Business, as well as UCT lecturer Shose Kessi who has researched black student’s experiences of racism at the institution. The discussion will focus on “UCT’s admissions policy, employment practices and its institutional culture”. Earlier this week, the Institute for Justice and Reconciliation said it stood “in solidarity with Rhodes Must Fall and related movements”. In a statement, it supported the removal of the Rhodes statue. “We recognise this movement as a call for more urgent and meaningful commitment to national transformation; of physical spaces, institutional access and employment equity, amongst others,” it said. US-based universities this week also launched a petition supporting calls to remove the Rhodes statue. Students and staff members at Columbia, New York University, The New School for Social Research and City University of New York said in a joint statement the Rhodes statue “in its current position… glorifies an arch-imperialist who made his wealth from the exploitation of black labour, and represents the alienation and exclusion that many black students feel at UCT”. “We support the demands to remove it and in doing so problematise UCT’s colonial past, and ongoing institutional racism,” read the statement. “We understand that these calls are about much more than just the statue itself. They are about a lack of transformation at institutions of higher learning in South Africa, especially institutions like UCT. It continued: “We call on convocation and the university executive council to respond to the call to remove the statue of Rhodes at UCT, and thereby begin the long overdue process of substantive and meaningful transformation at UCT.